From Our Hearts: When a bride and/or her girls book Blossom & Beauty for the day, they always look spectacular. Traveling to the venue when and if needed is an amazing plus for any bride on her big day. Lovely stylists that bring out the beauty in each and every client! Piece of Advice: It’s going to be difficult to get some sleep the night before, that’s to be expected. Take that night to just be alone and prepare your mind and heart for the following day, the wedding day goes by extremely fast so take a moment to breathe and try to get some good rest. From Their Hearts: The first time I saw this venue, I was completely blown away. It has everything a bride would want, beautiful lake, a lush green area and a spectacular getting ready room for the ladies. The lighting is perfect and very spacious. What a Deal! 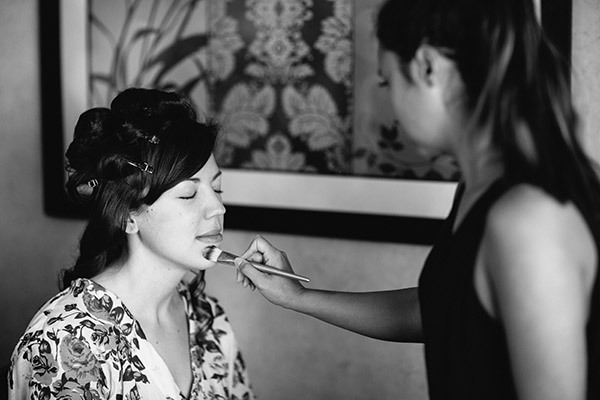 If your bridal party exceeds 5 bridesmaids receiving services, we will provide a second stylist at no extra charge.